The oblique technique was pioneered by Balsley  and involves probing the electrojet with a broad beam so as to illuminate the electrojet over a wide sector in the equatorial plane. Coherent scatter can then be received from near zenith to much lower elevation angles. The lower the elevation angle, the greater the distance of the E layer, while the greater the projection of the radar line-of-sight on the electron drift velocity, the greater the mean Doppler shift of the echo. By tabulating the type 2 Doppler shift versus scattering slant range, one can readily estimate the mean electron drift velocity and the polarization electric field [e.g., Hysell and Burcham, 2000 ]. On the other hand, by using the type 1 Doppler shift one could get relative measurements of electron temperatures and the mean zonal neutral wind [e.g., Balsley et al,. 1976 ; Chau et al., 2000 ] This technique assumes a thin-slab electrojet geometry and gives no altitudinal information. The technique has been recently improved by adding a new antenna array that generates a very narrow oblique beam in the East-West direction. Hysell et al. , with the help of a three-dimensional numerical model of the low latitude ionospheric electrostatic potential, has used these data to obtain profiles of zonal neutral winds at E region heights. 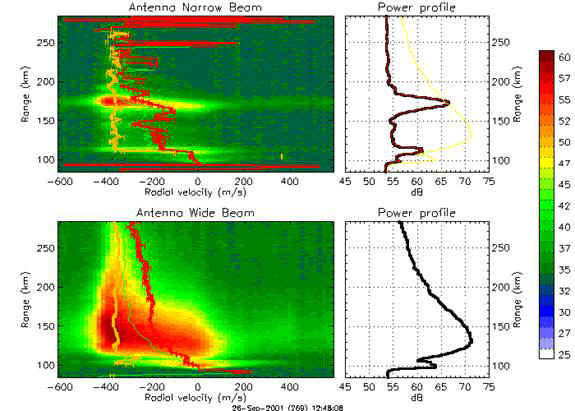 Below are spectrograms obtained using the oblique technique in the East-West [e.g., Chau et al., 2000 ] and Narrow-Wide [e.g., Hysell et al., 2001 ] modes.